If I had to describe Devil May Cry 5—and I do, it’s my job—I’d call it a guitar riff. You know the type. The big, cheesy run that’s trying, so hard, so very earnestly, to be cool. But it has something, some bit of inspiration and wit, that even though trying to be cool is the least cool thing in the world, you still really dig it. You start dancing, a little. Yeah, you say. Yeah, this is cool. This rocks. By the sixth game in a series (don’t let the title fool you), no videogame franchise is really hanging onto its original mystique. For Devil May Cry, that mystique was a combination of style and excitement, a sense of both the revolutionary and the unbearably cheesy. Devil May Cry is a series that began as action hero pastiche, welded onto a truly innovative combat system that opened up an entirely new subgenre of hack-and-slash games. Dante was cool beyond cool, a pizza-eating ’80s-style one-liner-spouting warrior who was half demon and used his powers to fight endless demonic hordes. That was almost 20 years ago, though. Dante is older now, more goofy than cool, and action games have changed a lot, with Devil May Cry now firmly a part of their DNA. What, then, is there left for an actual Devil May Cry to do? More than you’d think. Devil May Cry 5 justifies its own existence with a slavish devotion to being an absolute blast. This series knows it’s gotten old, but it’s less interested in examining its relationship to its past or its surroundings than it is in being the best, most exciting action game it can be. Devil May Cry 5 feels like a relic, the way a band trying to sound like hair metal in 2019 might sound like a relic. But it’s still a virtuoso. The plot outline is simple: You start the game as Nero, one of a small social group of demon hunters, roughly led by Dante, the protagonist of the older games. There’s a mysterious demon invasion, Dante’s been trapped by the big baddie, and you have to work with your teammates to save Dante, slay monsters, and look incredibly cool while doing it. 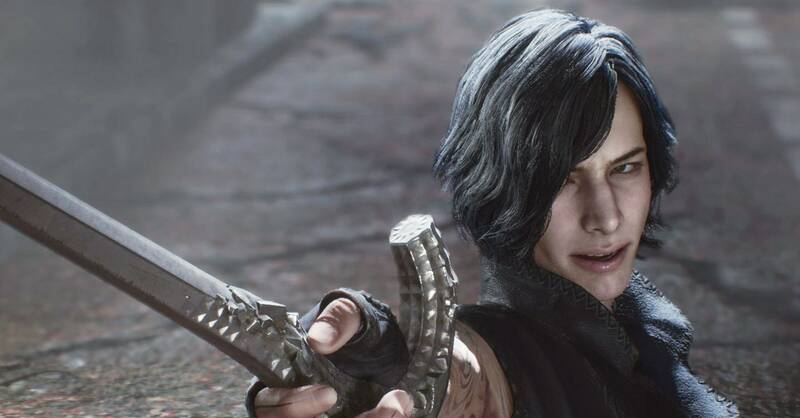 Devil May Cry 5 justifies its own existence with a slavish devotion to being an absolute blast. Within these modest goal posts, Devil May Cry 5 succeeds wonderfully. Playing, eventually, as all three warrior members of Nero’s crew, you fluidly slash, shoot, and magic your way through armies of the demonic. Action is fluid, easy to control but tricky to master, and is graded throughout on how stylish and varied your execution is. All in all, it feels very much like, well, Devil May Cry. If you haven’t played a DMC game since the 2000s, you might be shocked by how familiar it feels. The basic rhythms of play for two of its three playable characters—shooting far away enemies, using combos of sword and gun to launch enemies into the air and then decimate them there—feel strikingly unchanged from the early days of the series. Devil May Cry 5 is a throwback—defiantly so. Being a throwback has its disadvantages, though. Enemy targeting feels remarkably clumsy for a 3D game in 2019, and switching between different enemies to focus on is trickier than it should be. Nero’s special ability lies in his prosthetic arms, a set of which he can carry with him at any time, but there’s no way to switch the arms on the fly without deliberately destroying the one you’re carrying. The voice acting is, uh, sometimes pretty questionable, and the gory horror vibe of a lot of the demons isn’t honestly all that visually arresting. And, honestly? For an action game in any era, that’s still a pretty good sales pitch.